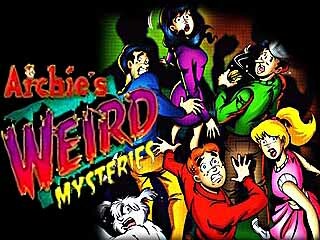 Archie's Weird Mysteries is the most recent animated adaptation of the Archie comic book, airing from 1999 to 2000 (one season). Unlike the usual goofy nature of the series, this show actually showcased the gang getting into supernatural adventures and having to tangle with monsters, ghosts and other paranormal or extraterrestrial activity. DiC Entertainment provided the animation and the series, while still fairly comedic, actually drifted into dark territory sometimes (though not by much; think of something along the line of Goosebumps). In 2002, an animated movie called The Archies in Jugman with the same cast aired. It featured the gang having to deal with a frozen caveman who gets thawed out and has a resemblance to Jughead. The entire series is available on DVD from Cookie Jar as of February 2012. Currently airing in reruns on Qubo's Night Owl block. Betty and Veronica step up to the task if needed. Supreme Girl in Supreme Girl vs. Dr. Arachnid is a superheroine. Ad Bumpers: These were done in character. "Now back to Archiekins' Weird Mysteries"
Aesop Amnesia: Lampshaded in one episode where Archie wonders if Veronica's experience as a giantess would teach her a lesson about discrimination before deciding that it's unlikely. The ending shows it stuck at least for a little while. A.I. Is a Crapshoot: "Little Chocklit Shoppe of Horrors" has a new computer program installed to help run Pop's shop. As you may have guessed, it didn't take long for it to decide humans were the weak link in the system and try to murder several members of the cast. All Just a Dream: The episode "Dream Girl" does this. Alternate Timeline: "Alternate Riverdales", the second in a trio of connected episodes focusing on time travel. Ambiguous Disorder: Jughead being "different" is mentioned pretty frequently here, sometimes along with an aesop of not looking down on those who are different. His train of thought is pretty off from everyone else's, he can get overly focused to the point of blocking out the world around him in one episode but have his mind wander to weird thoughts in another, and his social behavior is at best a lot less toned than everyone else's (such as literally pounding a table from laughing too hard). Depending on the episode, it can be even more or less pronounced; most traits line up with the autism spectrum, but there are also plenty that are just weird quirks. And I Must Scream: "Mega-Mall of Horrors" is about teenagers who are lured into a cursed mall and turned into store window dummies if they have no more cash on hand. When Archie is freed, he mentions that he could see and hear everything but just couldn't move at all. Medlock, for "Scarlet Night", "I Was a Teenage Vampire", and "Halloween of Horror", the three episodes connected to vampires. Vinnie Wells for "Archie's Date with Fate", "Alternate Riverdales", and "Teen Out of Time", with time travel being the connecting theme. Attack of the 50-Foot Whatever: Veronica in one episode. Based on a True Story: In-Universe, Archie's own Weird Mysteries article is often based on his adventures. On weeks when he doesn't have adventures, his articles turn into stories about crab people from the future and checkout lines slowing due to time manipulation. Bazaar of the Bizarre: Dr. Bomont's Emporium of Curios, Novelties, Antiquities, and Hard Lessons. First appears in "Driven to Distraction" and pops up every now and again to spur or provide clues on the latest mystery. Be Careful What You Wish For: Many, many times. One notable example is "Me! Me! Me!" Veronica wishes everyone were like her. When everyone begins turning into her, she's confronted with her flaws and quickly wants to undo the wish. Beautiful All Along: Olga as Supreme Girl. She ordinarily appears as a pale, redhaired Freshman who wears a dress that fades to her skin tone and glasses and a bun; but as Supreme Girl, she is far more glamorous and alluring. She tells Veronica that she'd rather be considered plain and unexciting as an ordinary high school student just so she'd have the privacy she wouldn't have as Supreme Girl. Bee Afraid: One episode had the gang dealing with mutated bees. In a surprising twist of fate, Big Ethel saves everyone by dousing the Queen with smoke, thus becoming the new queen, and commanding the other bees to never come back. Betty and Veronica: The originals, no less. Between My Legs: Both Veronica and Betty in "Dream Girl". Big Eater: Jughead, as usual. One episode theorizes his daily calorie intake exceeds 40,000. Another suggests the inside of his stomach leads to another world where he feeds thousands. Bookends: Some episodes begins and ends with Archie writing an article for his school newspaper. The ending usually has him going over an Aesop and the ending lines being, "In a little town called Riverdale." Bound and Gagged: Betty, Dilton and Veronica are tied and gagged with duct tape when thrown into a death trap in "Little Chocklit Shoppe of Horrors". The Cassandra: Archie becomes one. Cassandra Truth: Lampshaded by Reggie in one episode. Reggie: Newsflash: the world does not revolve around Archie Andrews and his overactive imagination! Chekhov's Gunman: In "Dream Girl," Big Ethel mentions a recurring nightmare of being chased by a monster. The monster turns out to be the old boyfriend of the girl in Archie's dreams. Chick Magnet: Whenever something female and supernatural rolls into town, its first target is Archie. Lampshaded in one episode when Reggie asks Betty what it is about Archie that keeps attracting girls. Christmas Episode: "The Christmas Phantom". The episode is actually based on Santa Claus answering Archie's wish for a weird mystery. Clark Kenting: Used in "Supreme Girl vs. Dr. Arachnid" with Supreme Girl and her alias, Olga Capucchi. Clone by Conversion: "Me! Me! Me!" shows Veronica accidentally causing the populace of Riverdale to start gradually turning into duplicates of herself after making a misguided wish on a wish-granting artifact that everyone was more like her. By the time Veronica is able to reverse this, the whole town is filled with snobby teenage girls and even Archie and Betty are starting to not act like themselves. Comic-Book Adaptation: Naturally, Archie Comics published a tie-in comic book (thus, making the book a Recursive Adaptation). It was notable for featuring Riverdale characters like Cheryl Blossom who never appeared on the show. Compressed Vice: Since most episodes start off by showcasing whatever character trait will complicate this week's problem, some of them can come off as this, such as Archie being a schedule freak in "Dream Girl". In "Attack of the 50 Foot Veronica", Jughead apparently likes to go for an "evening think" to ponder mysteries. He meets up with Archie in "Curse of the Mummy" on one of these. Lucinda's dog in "Cinemadness!" still makes the meowing sound it did in "Zombies of Love!". As detailed in Aesop Amnesia, Archie mentions the time Veronica was a giantess. Contrived Coincidence: Played straight in one episode. In order to stop a giant pudding monster from growing out of hand, Archie and his friends need to drop a rain formula from the sky by someone who has a plane and can fly it. It just so happens that Reggie's uncle has a plane and Pop Tate has an aviator's license. Corrupt Corporate Executive: Subverted in "Monster in the Night." The executive did buy the silence of the victims, but only because his company did end up fixing the formula problem that was causing mutations and wanted to prevent the negative press from closing the new Riverdale plant, which would create hundreds of jobs for the town. Crossover: The comic book series did an issue guest-starring the original Mighty Crusaders, visiting from a parallel universe. Darker and Edgier: This series actually puts the Archie gang in more scary and supernatural situations than in the mostly comedic comic books. It still retains its comedic values, however. Dark Is Not Evil: Dr. Bomont has a fairly sinister appearance and runs a novelty stop that's a weird mystery all on its own, but is a genuinely nice guy that tries and help Archie, as well as keep a lid on some dangerous forces like the genie in "Compu-Terror." "Something is Haunting Riverdale High" focuses on Dilton building a device that ends up phasing himself, Archie, Midge, and Big Ethel into another plane of existence, basically turning them intangible and invisible. The episode reveals more about Midge and Ethel beyond Midge simply being Moose's girlfriend and Ethel chasing Jughead, respectively. Dilton also sadly notes that the only time anyone talks to him is when they need help with science.note Which is also true given the episode format. He was missing for an entire day and no one noticed before Archie became intangible. After they get turned back to normal, Archie decides to spend the rest of the day with them. "Dance of the Killer Bees" is another episode which focused on Ethel, as we learn she's also president (and the only member) of the Bee Keeping Club. Archie also inspires her to run for Prom Queen alongside Betty and Veronica, and she wins. The villain of "Mega-Mall of Horrors" was a man who made a Deal with the Devil to sate his material desires. The ending, where he and his mall are pulled underground for losing all his victims, implies the devil came to collect him instead. "Ship of Ghouls" nearly had this happen to Reggie due to a curse on a treasure if not for Archie, Betty and Veronica pulling him away from it. Not so much for the zombie pirates who returned to claim their treasure and were so consumed by greed that they burned with the treasure when it fell into a lava fissure. Death Trap: If there's ancient ruins, there's death traps. Even the idol in "Me! Me! Me!" was originally surrounded by them; an effect expertly recreated by the museum the gang needs to retrieve it from. Why a museum would even have death traps is a good question. Dirty Coward: In "Fleas Release Me," Reggie has a werewolf trying to get at him. When Archie and Jughead arrive, Reggie tells the werewolf to eat them. Disney Death: In "Ship of Ghouls", Reggie loses one of his flippers to a shark while treasure-hunting. While looking for him, Archie and Betty happen on the same shark, briefly convincing them he's dead. Disproportionate Retribution: Vinnie Wells, the main villain in the time-travel saga episodes. After being arrested in "Archie's Date With Fate" for robbing a bank (courtesy from Archie and his time belt), he manages to steal Dilton's time travel device after he was released in prison 30 years later and plotted revenge against Archie Andrews (mentioned in "Alternate Riverdales") and the entire population of Riverdale (added in "Teen Out of Time"). How his hatred all started? Archie refuses to lend him some money for Nachos during his date with Betty and Veronica. In fact the sole reason of his revenge is just because of him not getting Nachos. Double-Meaning Title: "Green-Eyed Monster" talks about the jealousy Betty and Veronica have over new girl Dorsa Finn and Dorsa Finn, having green eyes, being a sea witch who transformed herself into Archie's ideal girl to keep him to herself. Dragged Off to Hell: Strongly implied to happen to Mr. Aborichi at the end of "Mega-Mall of Horrors". Dramatic Irony: After relating her nightmare about a redheaded vampire to Betty, Veronica insists it wasn't the vampire angle but the red hair part that scared her. Considering the object of Veronica's affection has red hair, this is either the case or she simply didn't want to admit she was scared of vampires. Dream Sue: In "Dream Girl", Archie ends up engaging in some lucid dreaming and turns it into this. Early Installment Weirdness: "Attack of the Killer Spuds" feels somewhat different than future episodes, particularly the voice-acting being different than others. Betty and Veronica in "Green-Eyed Monster". Veronica: Look, we've been rivals a long time, right? Betty: Longer than I could remember. Veronica: And we're the only two who can fight over Archie, right? Betty: Wouldn't have it any other way. Veronica: Then let's join forces and submarine this new Dorsa girl. Scarlet with Archie, Jughead and Reggie when Medlock starts favoring Veronica over her. Evil Laugh: The narrator who gives previews of the episodes lets loose an evil chuckle in "Me! Me! Me!" Jughead: (discussing on how Reggie is missing werewolf criteria) What exactly is a pentagram, anyway? Archie: It's a five pointed star! Expy: Visiting superhero Supreme Girl is a clear nod to Superman with her Flying Brick powers and element weakness. Her foe, Dr. Arachnid, hearkens to Spider-Man foe Dr. Octopus with his Combat Tentacles-style arms. Even Reggie Has Loved Ones: He stops a gang of trolls from hurting some kindergartners because he had a young niece named Amy staying there. He comforts Amy and make sure she's safe before heading off. Mega-Mall of Horrors: Mr. Avericci never expects Jughead to not be greedy and remain loyal to Pops' Chocolate Shop when the mall closes it. The Vampire Arc: Medlock fails to understand the concept of friendship when he betrays his most loyal servant, who ends up turning against him. Little Chocklit Shoppe of Horrors contains an example of Logic Cannot Comprehend Emotion. The Stanley 9000 doesn't understand why Pop values personal attention and people's safety over efficiency. This leads to its Start of Darkness, causing it to believe that humans are inefficient and must be destroyed. Eyes Always Shut: Averted with this show's version of Jughead, whose eyes are consistently open, as opposed to the comics where they were usually closed. Fantastic Aesop: Respect your family traditions, kids. They may be the only thing keeping a giant worm from destroying your home town. Fetish: Dorsa the sea creature has a thing for red-haired men. Naturally, her latest target is Archie. The Friend Nobody Likes: Reggie. The gang usually saves him because it's the morally right thing to do, but he does come through in the clutch. Fountain of Youth: In "Twisted Youth", all the adults become young from drinking bottled water. The reason is because a special crystal was found in the spring that bottled the water and is thus causing them to become young. Genre Blindness: So...after a lot of times where Archie suspects something, and it'd turn out to be real, you'd think that people would realize he's not kidding, right? Nope. A couple of episodes have people believe this, though. Gentle Giant: Moose. This is best shown in the final episode where he befriends the rival wrestler—a robot—and gives him a new job helping his father at the mechanic shop he runs. Granola Girl: Betty has traits of this. "Groundhog Day" Loop: The subject of "Archie's Date With Fate". Archie is the only one who remembers everything due to his previous use of the time belt. Has a Type: Dorsa has a preference for redheaded men. Naturally, her sights land on Archie. HeelFace Turn: Scarlet, the vampire girl in the second and third episode of the vampire arc. Hidden Depths: "Something is Haunting Riverdale High" reveals that Midge is training in gymnastics because she wants to be a stuntwoman, and Big Ethel is knowledgeable of old coins and interested in magic. Hoist by His Own Petard: Medlock sealed his own doom when he drained the youth out of Scarlet and cast her aside. Scarlet turned out to the "Ender" of prophecy who could have brought about eternal night. But instead, she used the sun to turn him to dust. Intrepid Reporter: In this continuity, Archie writes for the school paper and actively looks for engaging stories. Insistent Terminology: A 50 foot tall Veronica is "big-boned" not "enormous". "Invisible Archie" has Archie and Reggie becoming invisible after accidentally spilling Dilton's potion on themselves. Reggie proceeds to act like H.G. Wells' invisible man. "Something is Haunting Riverdale High" had Archie, Dilton, Midge, and Ethel turned invisible and they were in another plane of existence. Irony: Medlock's goal was to "befriend" (read: turn into a vampire) the "Ender", who would help him bring about eternal night. "Halloween Night of Horror" ultimately reveals that he had already befriended the Ender; His loyal servant Scarlet was the one the prophecy spoke of, but he used and cast her aside, only realizing his mistake when it was too late. It Came from the Fridge: One beast was a giant pudding monster, given life by a growth formula. It's All About Me: Veronica in "Me! Me! Me! ", of course, due to a spell which, as you can imagine, didn't pan out so well. I Was Quite a Looker: In "Twisted Youth", any adult drinking a specific brand of bottled water becomes younger. This is especially noted when Miss Grundy turns young. Jackass Genie: Reggie inadvertently releases one in "Compu-terror". Jerkass: Reggie. He was already one in the comics, but there he's sometimes been a Jerk with a Heart of Gold. Kill and Replace: "Attack of the Killer Spuds" revolves around the titular spuds trapping victims in a Lotus-Eater Machine state while potato-grown clones spread over the planet, using them as a perpetual food source. Killed Off for Real: While a few of the villains are presumably killed off, there's no ambiguity when Medlock is dusted by Scarlet, and Nilnewz by Archie, Jughead, and Reggie, Mr. Aborichi is Dragged Off to Hell, the Trog leader is blasted to oblivion by Betty, and the pirate ghouls dive into the lava. Also, although it's quite vague, when Scarlet turns into a spirit and crosses over to the other side. Kryptonite Factor: Supreme Girl, in keeping with her being a Superman Expy, loses her powers and grows weak whenever she's near an element known as "Trentonium". Limited Wardrobe: Veronica mostly only wore the same outfits, in contrast to in the comics where most characters (especially Ronnie, Betty, and Reggie) have an Unlimited Wardrobe. It's justified due to the constraints of animation compared to comics. The Little Shop That Wasn't There Yesterday: In thise case, "The Huge Mall That Wasn't There Yesterday" as seen in "Mega Mall of Horrors". Loves My Alter Ego: In "Supreme Girl vs. Dr. Arachnid" a new Freshman student named Olga has a crush on Archie, he in turn has a crush and admiration on her superhero persona "Supreme Girl". Lover Tug-of-War: Betty and Veronica pull this on Archie at their most petty. In "Me! Me! Me!" the real Veronica and the Veronica-ized Pop Tate both pull on Archie's arms until Betty stops them. Made of Iron: Everyone. Car crashes, falling, monster attacks, getting thrown by an angry giant Veronica, no one even gets a scratch. Magic Pants: Averted in "Attack of the Fifty Foot Veronica" (if you don't count her earrings, which oddly grew with her). Man in a Kilt: Archie in "The Day the Earth Moved". MayflyDecember Romance: Implied in "Green Eyed Monster" where Dorsa outlives her husbands. To be fair, she's a sea creature who kept those "husbands" trapped with her forever. It was just a source of will power for whomever could survive her. Me's a Crowd: Veronica learns the hard way that the world's all right with only one of her in "Me! Me! Me!". Missing Episodes: Qubo skips the vampire episodes...whether this is because the content is too dark or because the episodes were not included in syndication (they were once released as part of a DTV movie) is up for debate. Multi-Armed and Dangerous: Dr. Arachnid, who has four mechanical arms in addition to his normal ones. Mundane Solution: In "Brain of Terror", the only way to reverse a brain growth helmet that Moose has been constantly using is to cross the wires. Dilton dismisses it until Moose does it in the end. Also counts as a Brick Joke. Mummy: Seen in "Curse of the Mummy". He was a pharaoh who was in love with an ancestor who looked similar to Betty...but kept constantly stalling their wedding. When she died, he was so upset that he desecrated all the statue faces, shattered every mirror and even carved off the face of his own sarcophagus. He came back to life after Archie kept taking pictures of him, and stopped when every picture got ripped in half. Muscle Angst: Archie and Reggie both go through this in the episode "Invisible Archie" due to Betty and Veronica's attention being focused on some large jock. My Friends... and Zoidberg: "Archie, Reggie, Veronica, Betty! Jughead, too!" Betty and Veronica both experience this in "Dance of the Killer Bees". While both are running for Prom Queen, neither of them thought they'd lose against Big Ethel and spent most of the episode "feeling sorry for her," until Ethel told them she had fun running against them even if she probably doesn't win. Betty and Veronica then both felt horrible for being so condescending when they realized Ethel deserved to win, as she just spent her time earnestly campaigning instead of trying to tear down her competitors, like the two girls had been doing to each other. In "Brain of Terror", Moose adamantly refuses to take off the brain growth helmet even though it's changing his personality and alienating everyone around him. Then Midge gets hurt because of him and suddenly he can't fix things fast enough. In "Cine-Madness", Reggie's retrieval of his celebrity crush's character from the movie unleashes a band of vicious trolls on his niece's day care. He's horrified and can't fix things fast enough. A more downplayed version but "Something is Haunting Riverdale High" features Archie looking legitimately guilty when he realizes how badly he's been neglecting Big Ethel, Midge and Dilton after they all remark on how invisible they feel most of the time. Veronica in "Supreme Girl vs. Dr. Arachnid", when she realizes her careless use of gossip has given Dr. Arachnid the edge against Supreme Girl. Mythology Gag: In "Driven to Distraction", at one point, Dr. Bomont offers Archie "a compact disc of Ron Dante's greatest hits". Ron Dante was the lead singer of "The Archies", the protagonists' band in The Archie Show. The intro song has Jughead introduced in a My Friends... and Zoidberg fashion. The Archie Show did the same thing. Near-Villain Victory: Medlock succeeds in turning the whole cast into vampires, even Veronica, who was believed to be The Chosen One. But the real chosen one, Scarlet, whom he had betrayed, accepted her destiny and destroyed him. Never My Fault: The Stanley 9000 of "Little Chocklit Shoppe of Horrors" has this sort of attitude when it takes things too far. It gets asked to take two practice dummies to the airport in the most efficient way possible in a taxi, it drives off a cliff and ends up destroying the dummies and the taxi. It's programmed to test a new chair that feeds people, it overfeeds Jughead to the point of burying him in burgers and him asking, in clear terror, to be let go. Each time, it states the problem is humans because it can't comprehend that it's putting people in danger and it "never makes mistakes". Never Say "Die": Played with. Some alternatives like "slain" are used, but the show will pull out "death" and "die" in serious situations. Never Smile at a Crocodile: Subverted in "It Came From the Sewers". Despite being mutated, Peanut, Jughead's pet alligator, still remembers his owner and he eventually is taken to Florida to be taken care of. Nice Guy: The robot lookalike of Reggie in "Reggie or Not". The climax features the robot and Reggie trying to out nice each other and Reggie winning because if the robot really was that nice, he'd let Reggie win. Archie buying two dice for his car in "Driven to Destruction" results in his car coming to life and going Yandere on him. "Fleas Release Me" has Reggie dressed as a werewolf and scaring Archie, Betty, and Veronica. The consequence is that the sheriff ( who is the real werewolf) takes Reggie into custody for the werewolf attacks around Riverdale. "Attack of the 50ft Veronica" has the titular character of the episode getting herself zapped with the growth ray. Guess what happens? "Green-Eyed Monster" would have Betty and Veronica trying to get rid of Dorsa. Not only the attempts failed, but also Archie losing his trust in them. Veronica is unknowingly responsible for getting Dr. Arachnid the means to defeat Supreme Girl. "Zombies of Love": Veronica accidentally leaving the magic salt that made Archie a love-obsessed zombie at Pop's Choklit Shop (which Pop unknowingly used to flavor some french fries that everyone ate) caused many of Riverdale to become love obsessed zombies over here. In "Little Chocklit Shoppe of Horrors", Dilton gets the Stanley 9000 for Pop's. It ends up terrifying every single customer and nearly kills him, Betty and Veronica. Nice Job Fixing It, Villain! : Medlock, the vampire master, actually had all the cards that the prophecy foretold would bring about darkness. But then he betrays Scarlet, his most loyal servant, by taking away her youth to revive himself. This backfires when it turns out Scarlet was supposed to be the girl to help him take over the world. Noodle Incident: We don't know why other than he must have done something to tick her off, but for some reason, Jughead is very afraid of the Tooth Fairy. Once per Episode: Archie always ends his closing narrations with "...In a little town called Riverdale". For starters, they are completely fine in direct sunlight as long as they are in human form or even smoke. Although as Scarlet explains it, older vampires such as Medlock can't survive in sunlight no matter what, but lesser vampires can manage with the help of heavy duty sunblock. A single bite is all that is needed to turn someone into a vampire. The spell can only be broken if the original vampire is destroyed (or at least turned back into a human). It is also implied the Master can change vampires back into humans like he did to Scarlet. Our Werewolves Are Different: Turning into a werewolf requires a wolf bite, the full moon, and possession of a pentagram ( which is only defined as a "five-pointed star", so a sheriff's badge works just fine). Putting something silver on the werewolf will turn it back and prevent further changes. The interesting thing about the wolf bite is that it does not seem that a full wolf is needed, as a wolfdog that is mostly dog will do. O.O.C. Is Serious Business: "Beware the Glob". Pops thinks the boys saying there's a glob monster made of pudding is just a joke (despite his shop being overrun by giant cockroaches and a sentient computer) but when Jughead, burger obsessed food junkie that he is, says there's no time for burgers, something must be wrong. In-Universe. Archie's column is apparently read by government agents because of all the weird stuff he's up to. In another in-universe example, Veronica using the school's gossip column to report on Supreme Girl gives Dr. Arachnid an advantage for most of the episode. Police are Useless: The one time they show up is after a 50 foot Veronica rampaged through town. She shrinks down Just in Time before they show up and they buy the She Went That Way ruse despite Veronica being naked and standing in the tent which she makeshifted a dress out of. Add to that they missed her shrinking down despite her being (at most) twenty feet in front of them. Prophecy Twist: Used in the three-story arc upon the chosen one who could defeat Medlock. Robotic Reveal: Subverted the first two times and then played straight in "Reggie or Not". First, Archie uses a magnet on the Reggie-bot and it sticks to his chest, but it's because the robot has a cookie tray on him that he was going to give to Betty. Then, Archie tosses a bucket of water on him, but the robot senses it and bends over just in time, leaving Veronica soaking wet. Last, Archie is almost run over by a truck and the robot pushes him out of the way...but half of the robot's face got scraped off. Jughead: Holy Cosmic Muffins! Archie was right! Reed Richards Is Useless: How the hell does Dilton not get have government agents knocking on the door asking for him to come up with inventions for them to better mankind? Even if a lot of his inventions wind up setting up the plot somehow, it's because they're irresponsibly used or they malfunction. Royal Brat: Veronica, though she's shown to learn her lesson. Secret Test of Character: In "Driven to Distraction", one is given to Archie, due to basically ignoring his friends in favor of his car, so the fuzzy dice he buys make the car go Yandere. Lampshaded by the proprietor of the shop that sells him the fuzzy dice, who gives him every chance to remember he's paying for them with the money he needs for his date with Veronica. Dr. Bomont: I always hate it when they go for the hard lessons. Scary Librarian: Shown in "A Haunting of Riverdale". The ghost of Quiet Violet is haunting the library for two reasons: 1) to make sure all the people who had overdue books returned them and 2) finally meeting up with Jughead to make amends over their first meeting and to encourage him to go to the library again. Betty actually dressed as Lara Croft in "Misfortune Hunters". The episode with the insane Yandere of a car has Christine coming to mind. When Betty calls about a big beetle on her lawn, Archie asks "Paul McCartney?" The wolf-breeder Archie goes to for advice about werewolves is named Old Man Cheney. In "Attack of the 50-Foot Veronica", Jughead calls the gigantic Veronica "Girlzilla". Archie gets one in the episode "Green Eyed Monster". He's surprisingly buff. Jughead gets one in "The Day The Earth Moved". Spared by the Adaptation: According to the tie-in comics, Scarlet was brought back to life by the vampires; when she sacrifies herself to save Archie and the gang once more, she is rewarded by being transformed into a living human girl. A throw-away line implies she was always a human girl under a spell, with the other, evil vampires being true vampires. Story Arc: Two major ones that made up three-part episodes. One dealt with vampires, and the other dealt with time travel. Teacher/Student Romance: When Ms. Grundy is turned into a teenager, she starts coming on to Reggie. By the time he starts coming around to the idea, she's turned back to normal. Television Portal: Used in "Cinemadness!". Title Drop: "Archie's Weird Mysteries" is also the name of Archie's school paper column. Took a Level in Badass: The main cast, most notably Archie and Betty, are capable of taking down various monsters and supernatural beings in this series, which strongly contrasts from their more comedic natures from the comics. Unreliable Narrator: In "A Haunting in Riverdale", the former head librarian is haunting the town. Jughead remembers said librarian as the one who bullied and scared him away from the library, when she yelled at him for playing with the globe, told him a book that interested him wasn't for little boys, and finally yelled at him to be quiet because he was laughing. However, when the ghost is asked what happened, she presents a different version. She did come up and tell him to stop playing with the globe because it almost fell down on him. She did take away a book he wanted to read because it was falling apart and needed to be repaired. And she finally did admit to telling him to be quiet because he was making too much noise. Valley Girl: Betty's darkest nightmare is turning into one of these and losing her I.Q. Witch Doctor: Lucinda, whom the gang consult on occasion to help them in "Zombies of Love" and "Cinemadness". What Happened to the Mouse? : The plot of "Little Chock'lit Shoppe of Horrors" started due to the Chock'lit Shoppe losing customers to a new restaurant named "Speedy Burger", who uses microwaves to serve food faster. Though the Stanley 9000 helped him regain customers, Speedy Burger ceased to be mentioned, so it isn't seen if they're still a problem after the Chock'lit Shoppe was returned to normal. Though considering they reheat pre-made food with microwaves, they would have probably shutdown. What Measure Is a Non-Human? : Pulled on Archie in an episode where he unleashes video game monsters on Riverdale. Their leader goes after him for shamelessly killing so many of his men and bragging about it. Whole Plot Reference: "Attack of the Killer Spuds" to Invasion of the Body Snatchers. There was also Little Chocklit Shop of Horrors to 2001: A Space Odyssey. Wounded Gazelle Gambit: A cute little alien does it to Archie and the gang so he could gain their trust and make an alarm disruptor device so he can collect Riverdale's plutonium and sell it on the black market. Wrong Genre Savvy: Betty is convinced that Gleebo, the cute little alien of "Extra Terror-estrials", is like ET The Extraterrestrial, in that he wants to go home and needs to build a transmitter. However, she's hit with the hard truth; Gleebo is a rude, quick tempered thief, the machine he was building wasn't a communicator but a device to hack into security systems and the two ugly alien menaces chasing him were in fact police trying to apprehend him. Guess she saw that movie too many times. When Archie's car comes alive, it quickly becomes obsessively possessive of him. In the episode "Zombies of Love" after Veronica gets a voodoo witch to give her a love potion (disguised as salt) which she would secretly feed to Archie, Archie becomes this; it starts with him being overly affectionate and soon Veronica becomes his obsession. It gets worse when Veronica leaves the salt at Pops for Jughead, Betty, Reggie and everyone else there to use by accident. Towards the end she has everyone chasing after her obsessively, mentioning that she was "their's". Shudder. In "Dream Girl", we are treated to Maria Knot, a redhead girl from Archie's dreams who scares off other women so she can be with him forever in dreams and reality.